Bruce Lee has arguably done more for martial arts than any other person in the world. He was (and still is) a cult icon for his movies like Enter the Dragon and Fist of Fury, and he even started his own martial art system called Jeet Kune Do. 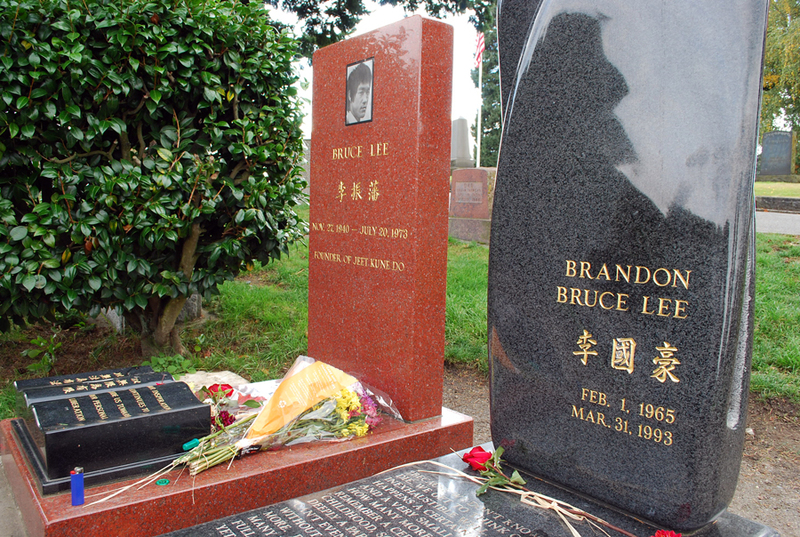 Lee was born in San Francisco, grew up in China, moved to Seattle (he attended high school and college here), and this is where you can find the Bruce Lee grave site today. The Bruce Lee grave site is located at Lake View Cemetery (1554 15th Ave. E.) on Capitol Hill (right next to Volunteer Park and GAR Cemetery). Established in 1872, Lake View Cemetery is one of the most famous cemeteries in Seattle. Not only is it home to the Bruce Lee grave site, but it’s also the final resting place for some of Seattle’s founding fathers (like Arthur A. Denny and Henry Yesler). When you arrive at the cemetery, you have to know where you’re looking to find the Bruce Lee grave site. After you go through the main entrance, drive (or walk) straight ahead. The path will curl to the left, and then take the first right turn (otherwise you’ll go in a loop back to the entrance). Take the next right after that and travel straight ahead. You’ll come to a weird three-way intersection, but you technically want to walk straight (up a little hill that veers to the left). Hidden behind a small hedge, you’ll find the Bruce Lee grave site. Click here for a map. There’s a little walkway that leads you to the front of the Bruce Lee grave site. There’s also a bench for those who want to take time paying their respects. Buried next to Lee is his son Brandon, who was also an actor and martial artist. Brandon was killed at the age of 28 in a fluke accident on the set of The Crow. 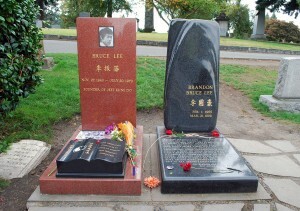 The Bruce Lee grave site is very simple. 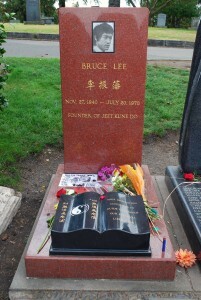 The headstone simply has a picture of Bruce Lee, his name in English and Chinese, the dates of his life, and it reads “Founder of Jeet Kune Do”. On the foot of the grave is an open black book. On the left side of the book is a yin and yang symbol with Chinese writing, and on the right it says “Your inspiration continues to guide us toward our personal liberation”. Named one of the top 10 celebrity grave sites in the world, thousands of people visit the Bruce Lee grave site in Seattle every year. There are always flowers, coins, and other trinkets resting on the plot. It’s an emotional pilgrimage for some, while others simply just want to see where the martial arts legend is buried (and take a picture or two). Whether you’re a fan of Bruce Lee or not, it’s a pretty neat experience to visit his grave site. 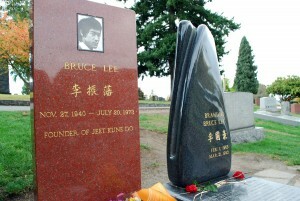 Have you ever visited the Bruce Lee grave site in Seattle? We’d love to hear from you about your experience. Please leave a comment below or connect with us on Twitter, Facebook, and Google+. 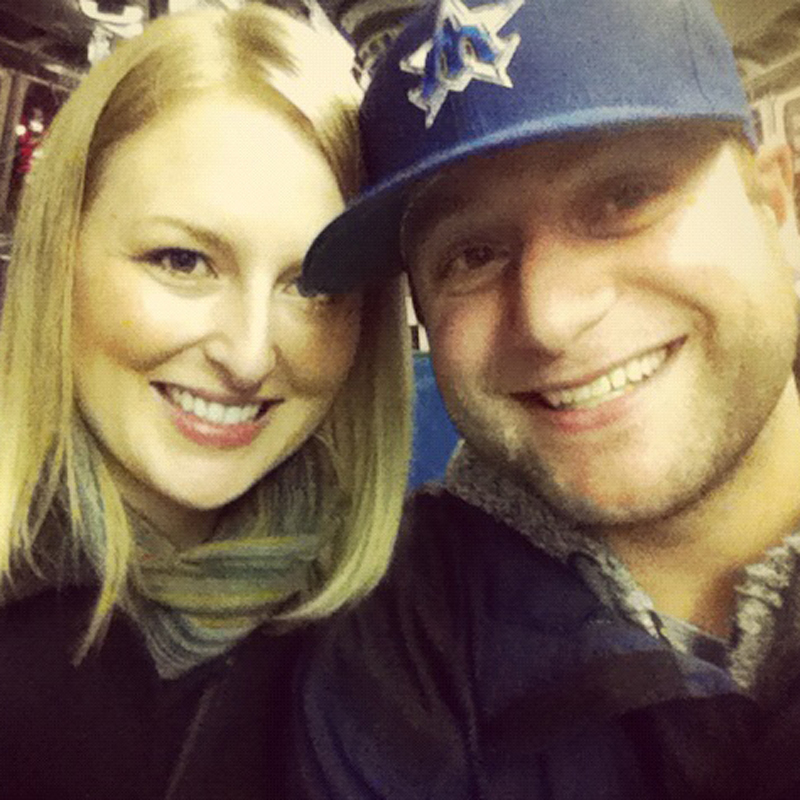 Don’t forget to also visit Seattle Bloggers for more places to check out in the Emerald City! I wash I could of met him .